Are you supposed to be doing something else right now? But someone or something has interrupted you? 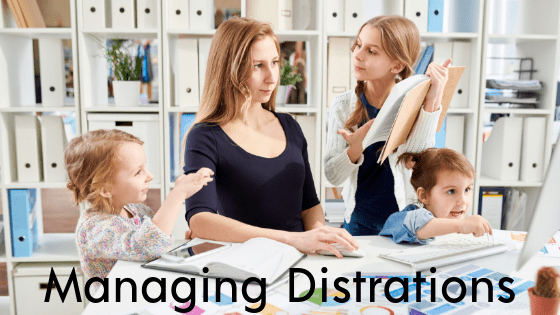 Managing distractions can be a huge challenge when working at home with children, pets or other home related activities going on. Sometimes we are distracted by ourselves which I call avoidance behavior. This is not what we’re talking about today. Studies have shown that the recovering from a distracting event can take up to 25 minutes. This is a huge time waster. So, how do you manage distractions that seem to be unavoidable? Set some boundaries for yourself and those around you. A common complaint that I hear from home based business owners is that friends think that they can just talk anytime or come over to visit any time. Just because you’re at home, they think that you are available. We teach how we will allow people to treat us. If you answer the phone each time your friend calls or invite them in each time they come over in the middle of the day, then you are teaching them that it’s ok to continue this interrupting behavior. When you first change this behavior your friends may not understand, but explain the issue to them and eventually then will understand and respect your boundaries. Setting office hours can help with this problem. You may be the biggest violator of your own business hours. It’s important to set that boundary for yourself, your friends and your family so that they know when you will be available. Your clients also need to know when you are available. To make sure you get the most important tasks done for the day, schedule a particular time during which you will completely focus. Eliminate all potential distractions including email, internet, and phone. You can start with 30 minutes and work your way up to longer periods of time. You will be surprised how much you are able to get done when you truly focus. Let’s face it, we really can’t completely eliminate distractions. So, being prepared for them will help to minimize wasted time getting back on track. Keep sticky notes handy. When you get distracted, jot down a quick note about your last thought or what you were doing when you were distracted. These issues are also a problem in the traditional office environment. The players are just different. The principles remain the same, though, so you can use these tips in that situation as well. I would love to hear your thoughts or comments!